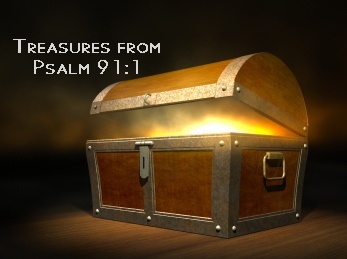 We’ve been uncovering some wonderful treasures in this first verse. Let’s stop and look at what we have so far. To DWELL is to move in permanently – trusting in God and obeying Him. When we do, we will experience the activation of His Holy Spirit hand of power, consuming with His fire all that destroys or tries to invade or keep us from His house. To dwell in the SECRET PLACE is to live in the midst of God’s heart, trusting fully in His Word that covers us with His covenant promises of protection, because He loves us and is head over all. The secret place belongs to the MOST HIGH. This is not your average landlord. We are permanently under the watch care of the Supreme God who is Sovereign over ALL. We are under His instruction, His protection and His enabling right hand of power. Under His rule we are connected with heaven bringing life to earth. To ABIDE, sounds like a repeat of to dwell, but we discovered that it promises even more. It promises that He will teach you and me how to overcome our enemies by His power, and how to keep them from invading our lives. We will be supernaturally trained for battle. Psalm 91:1 also says that we will be UNDER THE SHADOW of the Almighty. To be under the shadow means we will be in humility and righteousness, under the blood of Messiah, with His authority as our covering and His instruction for our guide. This is much more than a beach umbrella. He is not only the Most High God, He is the ALMIGHTY. When we abide under the shadow of the Almighty, we again have the Holy Spirit fire of God watching over us to consume our enemies at the door, with His right hand of power. This shadow provides security and provision unmatched by anything this world has to offer. Psalm 91 is for every single one of us. We need to know who our God is. We need to know why we need to be in complete submission to His care. We need to know we can trust Him. We also need to know what the true weapons of the enemy are and how to combat them. You will be shocked to see them and realize that we have real firepower to annihilate them completely. All of this and more are in the verses of Psalm 91. Be on the lookout for the next installment. In the meantime, if you are new to these posts, go back and read through the Psalm 1 posts for the ‘full meal deal.” If you need a breather to ‘Selah’ (Pause and carefully consider), then unpack a few more of your boxes, grab a cup of coffee or tea and settle into the Secret Place. You will be glad you did.